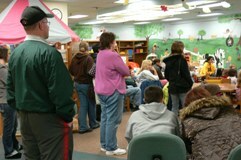 Newton Public Library participates in various book discussion projects throughout the year. Check Library Happenings and the Calendar for details. All programs are free and open to the public. Held two times each year at Newton Public Library, TALK (Talk About Literature in Kansas), is a program for those who love to read and discuss good books. Each TALK series is built around an entertaining and thought-provoking topic of interest to adult readers. The four books in each series are selected for reader appeal, literary quality, and relevance to the series theme. Discussion leaders and books for the series are provided by the Humanities Kansas. Readers who enjoy a good mystery are invited to join this monthly discussion, held the first Wednesday of each month at 5 p.m. Check Library Happenings for details. Books of general interest are the topic of this monthly discussion, held the Third Thursday of each month at 7 p.m. Check Library Happenings for details. A statewide reading and discussion project sponsored by the Humanities Kansas, a preschoolers is chosen yearly. Newton Public Library plans and participates in activities, discussions, and exhibits around the books chosen each year.